Sin and Swoon, based out of Montreal, love George and Tammy, old time country music, and the harmony singing of the Louvin Brothers and the Delmore Brothers. Singer-songwriters Mike O’Brien (Ottawa valley native) and Michelle Tompkins (Antigonish, NS) have been performing together for the last few years. Both have been busy backup singers/musicians on the Montreal local scene, lending a hand to such notables as Patrick Watson, The Barr Brothers, Plants and Animals, Blood and Glass, Katie Moore, and Thus:Owls. Mike O’Brien also played guitar on the last two Vic Chesnutt tours. Recently, Sin and Swoon were featured on The Vinyl Cafe with Stuart Maclean on CBC radio and NPR. With the release of their first record, Did I Turn The Oven Off?, they are planning to get out and play as much as possible and we’re really glad their plans include Deep Roots Music Festival this year. 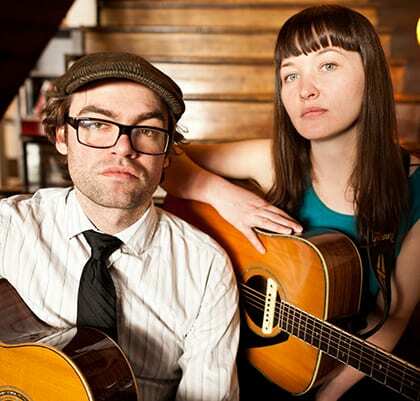 They are a part of a new project for Deep Roots this year that involves an exchange of musicians … Andy and Ariana, well known valley musicians, are performing at The Montreal Folk Festival on the Canal; Sin and Swoon are joining us at Deep Roots Music Festival.